Barber Shop Chronicles welcomes you into this unique, intimate community where African men gather to discuss the world and their lives. Get up close and hang out at the Barber Shop with on stage seating! The only Canadian stop on the North American tour. 12 performances only! Newsroom, political platform, local hot spot, confession box, preacher-pulpit, and football stadium. For generations, African men have gathered in barber shops to discuss the world. 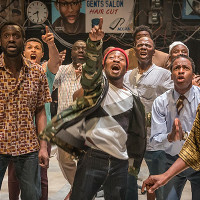 This dynamic new play leaps from a barber shop in London to Johannesburg, Harare, Kampala, Lagos, and Accra. These are places where the banter can be barbed and the truth is always telling.